Search Engine Optimization is so essential as part of the Internet Marketing. The basic step is to have a website. If you don’t, create one now. If you developing a website for Search Engine Optimization purpose, then I would say you are very smart! In this case, you can consult your Seacrh Engine Optimization consultant or us and we will know how to develop your website following the W3C rules. A website that is developed under W3C rules is best prepared for Search Engine Optimization. If you have a website now, before we start the Search Engine Optimization campaign for you, you need to check your website to see if it is ready for Search Engine Optimization. A website that is ready for search engine optimization is called Search Engine Optimization friendly. Well we are not going into detail about and technicality of Search Engine Optimization friendly but rather just to produce a quick self-check for you. Whatever go beyond this you can leave it to your Search Engine Optimization consultant. Make a few trials on the Search Engine with some relevant keywords to your business and see if your website appears. If you are not sure how it works, try to image you are looking for your suppliers. What are the keywords would you type? It works the same with your customers! Tips: A lot of people think if they are there in Search Engine while their customer typing their domain name means they are SEOed. 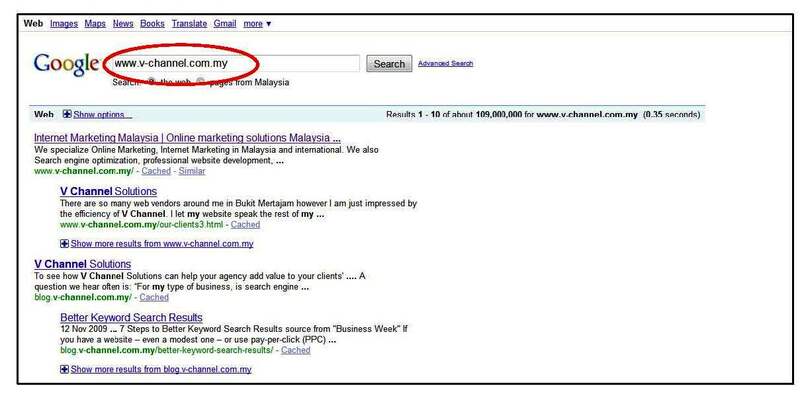 Do you know, typing your full web address (URL) does not mean you are SEOed! Chart 03: typing your URL in Search box is not the correct way of checking your SEO result. Check if your website URL is written in a human understandable language. Chart 04: This is a sample of SEO friendly URL. We can understand from the URL that this page is discussing on "search engine optimization". Chart 05: This is a sample of non-SEO friendly URL. Human cannot understand the meaning of the URL. You do not have to write very fancy content in your website. SEO friendly content means write up that straight to the point of your message, and emphasis of the message throughout your site. Avoid making the entire page will with images without text or proper description of your images. Search Engine does not read images well. Some people like to create their home page, or we call it landing page with full page of flash intro. This does not bring you any benefit to Search Engine Optimization. Avoid making the entire page will with flash without text or proper description of your images. Search Engine does not read flash. It will be good if you have a blog and hyperlink from your website. Normally blog like Wordpress, Blogspot etc are auto indexed and it helps in pulling traffic to your website. But please make sure your blog content is unique content in order to achieve the best SEO effect. If you subscribed to Google Analytic or any other traffic report, do check if your website has high traffic for now. Please consult your service provider to check if your website is done according to W3C principals. If you have everything above checked then your website is considered SEO friendly and it is ready for SEO. Else, you need to consult your service provider either to revamp or to improve your current website. SEO your website, call us now!